Step 1: From Off or On quickly tap the switch 10 times to enter Programming Mode. A dim slow blink will initiate. Step 2: Tap the Deck number. A dim fast blink will initiate. Step 3. Tap the number of mode group. A double blink & 1stmode in group will initiate. 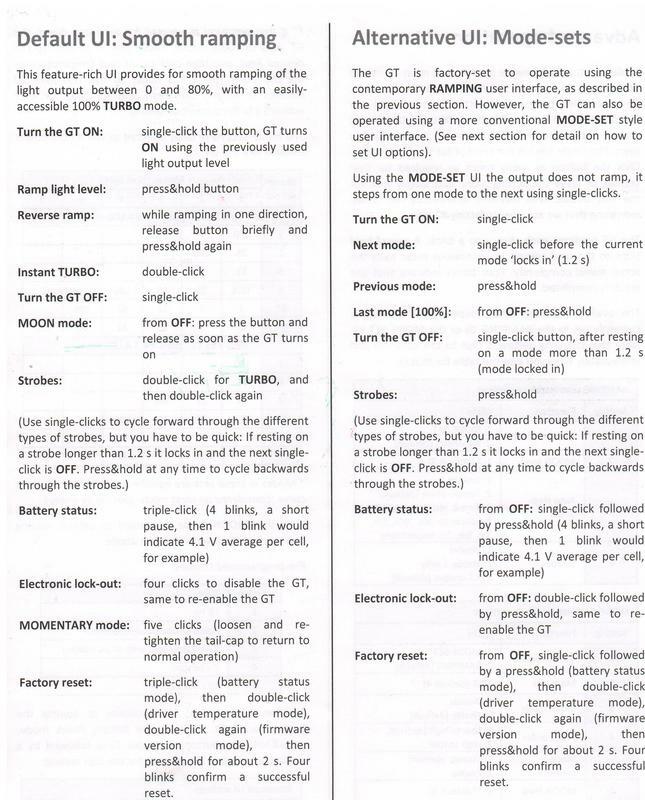 Toggle lock or unlock current Mode Group settings. After entering Deck 12 light will initiate Turbo. Let light run until desired felt temperature and or time. Turn off to lock in Turbo Timer. M = Last mode memory. Light will initiate last mode at next turn ON if light is off longer than 1/2 sec. Mode Group without M will always start with 1st mode. D = Double Tap. At any mode double tap switch to activate Hidden/Last mode. 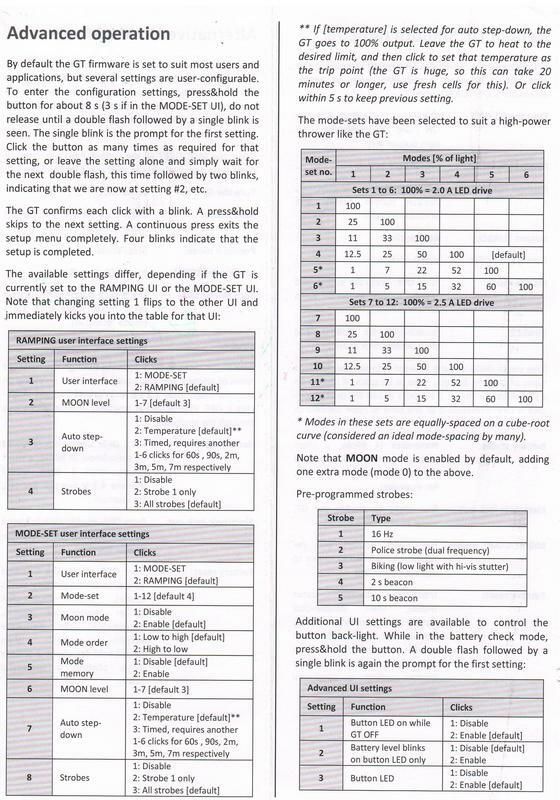 To switch mode groups: Turn on light for 2s then rapidly tap the switch 8 times, the light will then enter the programming mode and begin to flash. With the light in programming mode, tap the switch the same number of times as your desired mode group. The light will blink and your mode group will be memorized. B) Self Set Turbo Timer: Turn light on for 2s then rapidly tap the switch 8 times, the light will then enter the programming mode and begin to flash. With the light in programming mode, tap the switch 30 times to enter the turbo timer set mode. The light will then switch to 100% power. When the light is at the desired temperature for the turbo step down, turn the light off. The turbo timer will then be set. Maximum of 20 minutes. Setting a turbo timer below 4s disables it. It applies to all modes above 50% and smoothly ramps them down to 50%. The firmware has low voltage protection, if the voltage drops below 3V, the brightness is reduced. That brings the voltage up again a bit, but if the voltage of the drained battery falls below that again, brightness is reduced again - and so on, down to a very low level. Low voltage step-down can be disabled by me if desire. The blinking signal after 8 fast taps is actually a battery monitor, the number of blinks relates to battery voltage: One blink for each 0.1V above 3.0V, so 12 blinks is full, 3-4 blinks is quite empty. *No memory = always resets to 1st mode after 1 second of being off. *Memory = Always memorize last mode after 1 second of being off. From ON or OFF: A double-tap activate the hidden mode. From OFF: Quickly tap the switch 8 time to enter the config menu, indicated by a blinking signal. *Battery Voltage Indicator: It's one blink for each 0.1V above 3.0V, so 12 blinks is full at 4.2V, 3 blinks = 3.3V or near empty. During the blinking signal quickly tap the number times for the mode number you want to set. Mode 13 = 13 quick taps. Note that the timing is more relaxed in the config menu. You have to be swift and uninterrupted, but not as rapid as the 8 taps above. However you must hit the exact number of taps. Enter config menu by 8 (or more) fast taps, wait for the blinking signal, then enter turbo config mode by the 20 taps. The light then runs at full power. Let it run for the desired time (e.g. until it gets hot; use a full battery), then tap to switch off. That time is now set for the turbo timer. Setting a time below 4 seconds disables it. The turbo timer has a maximum of ~20 minutes (this is also the default). It applies to all modes above 50% and smoothly ramps them down to 50%. Whenever the battery falls below 3V under load, brightness is reduced (about half). The reduced load usually brings up the voltage a bit. When it drops below 3V again, brightness is halved again - and so on, down to a very low level. It will not switch off and leave you in complete darkness though. 8 Quick Click enters Config Mode. Light will blink ON & OFF if activated or does nothing if Config Lock. Note* Brief pause between Clicks for successful indication blinks before proceed. Note* All configurations memorized even after battery changes. Note* Double Blink at top of ramp indicates Maximum 70% reached. Double Click activate 100% Turbo. Last mode memorized. Note* Strobe is visually a bright constant ON with fast blinks achieved with specific blink frequency & duty cycle. Note* Beacon is a dim constant ON with slow double blinks. Good for beacon locator & roadside caution alert . Note* No fast way to turn off light before 5s. Great in practice but least tactical. Last mode memorized. Note* Similar to VNX2 UI. Last mode memorized. Note* Last mode memorized so no access Lowest/1st level from OFF. 8-1-2-2 = 5% – 50%. 8-1-2-3 = 20% – 50%. 8-1-2-4 = FF – 20% – 50%. 8-1-2-5 = FF – 5% – 15% – 40% – 70%. Note* Only some lights can run Dim FireFly. Incompatible lights will shed no light in Dim FireFly. Note* 2-3min is recommended for most Sky Lumen Lights. Light will ramp down to 50% power once Turbo Timer is initiated. After 10s, light turns on 100%. Quick Click when desired temp reached. Note* Set to ON = no more fumbling in dark looking for switch after battery changes. Great for caving. Also act as a Dummy ON-OFF with mechanically Lock Out lights. Note* Feature only available with specifically equip lights. Note* Also engage Mechanical LockOut by loosening Tail cap or body if available.